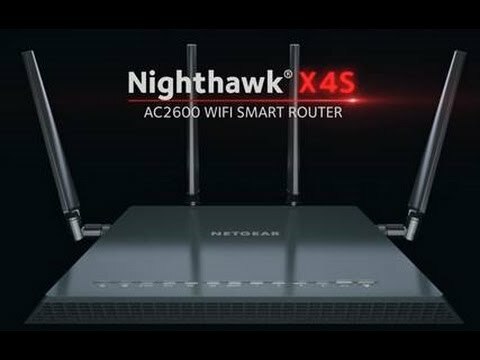 Nighthawk® X4S AC2600 Smart WiFi Router with 160MHz, MU-MIMO and Quad Stream technology delivers WiFi to multiple devices simultaneously for faster speeds. Stream 4K content in pristine quality with the highest possible 160MHz bandwidth. Enjoy ultimate WiFi speeds up to 2.53Gbps, a powerful 1.7GHz dual core processor, and Dynamic QoS, delivering smoother streaming and gaming by prioritizing applications and devices. Intensify Your Game Play & Reduce Lag. Nighthawk X4S offers extreme WiFi speed for gaming—Up to 2.53Gbps and 160MHz bandwidth further reduces the lag. The dual-core 1.7GHz processor boosts WiFi, wired, and WAN-to-LAN performance, while Dynamic QoS prioritizes Internet traffic by application and device for lag-free gaming. Powerful amplifiers and four high performance external antennas give you extreme WiFi connectivity throughout large homes and even backyards, while Beamforming+ focuses WiFi signals for better WiFi range and performance. Stop buffering and start enjoying uninterrupted streaming media for everyone in your home. Nighthawk X4S delivers the single fastest available WiFi connection to any one device, up to 1.73Gbps, and a total of 2.53Gbps. 160MHz support makes it easier to stream 4K content in pristine quality. With Quad-Stream X4S Architecture you’ll enjoy the ability to stream multiple HD videos at the same time. Dynamic QoS prioritizes your WiFi bandwidth by application, such as Netflix as well as by device for smoother streaming. Stream your own media by connecting USB 3.0 or eSATA storage devices and access it from anywhere. Maximize Your Range for All Mobile Devices. Double the bandwidth with 160MHz support and dramatically increase WiFi range for mobile devices with Quad-Stream X4S Architecture. MU-MIMO gives you faster speeds with simultaneously streamed data for multiple devices. Beamforming+ boosts speed and range, while Dynamic QoS bandwidth prioritization optimizes your Internet speed for gaming and streaming. Powerful amplifiers and four high-performance external antennas give you greater WiFi range throughout large homes and even backyards. With EZ Mobile Connect on NETGEAR genie® app, you can connect to WiFi securely by simply scanning a QR code. Traditional WiFi routers can stream data to only one device in the home at a time. When multiple devices are connected to the router, each device needs to take its turn, and then wait before receiving more data. This can lead to slower network and Internet speeds. Using Multi-User MIMO technology, NETGEAR routers can stream data to multiple devices simultaneously. With MU-MIMO, your WiFi network can deliver faster throughput to every MU-MIMO connected device. That means faster downloads and smoother streaming for your devices. Quad-stream Wave 2 WiFi, the industry’s latest WiFi technology, means the X4S supports up to four data streams in each WiFi band, maximizing connection speeds for faster gaming and smoother HD video streaming with greater clarity and less buffering. If you like gaming and streaming videos, then you can benefit from Dynamic Quality of Service (QoS). Dynamic QoS automatically prioritizes bandwidth to latency sensitive applications like online gaming and video streaming by recognizing application and device information as well as bandwidth needs. Dynamic QoS will also ensure that lower priority applications like file downloads will never get completely stopped. Basic WiFi routers use simple single-core processors to connect WiFi devices to the Internet. 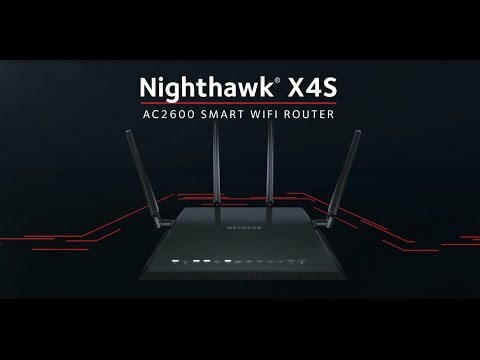 Nighthawk X4S delivers simultaneous dual band WiFi, Quad-Stream performance on each band, Multi-User MIMO, 160MHz, has 5 Gigabit LAN ports, as well as one eSATA and dual USB 3.0 interfaces to connect external USB storage. Using a single-core processor would cause severe performance issues as various processes compete for CPU Power. That's why the X4S utilizes a powerful 1.7GHz dual-core processor to separate processes and prioritize high-performance WiFi connections. Get the ultimate in WiFi & enjoy a blazing-fast, lag-free WiFi experience for gaming, video streaming or surfing. • World's fastest WiFi: Up to 2.53Gbps†. • 160MHz support: Doubles the streaming speeds. • Dual core processor: Dual Core 1.7GHz processor boosts wireless, wired and WAN-to-LAN performance. • Gigabit WiFi: Next-generation WiFi now at Gigabit speeds. • Gigabit wired: Ideal for HD gaming and video. Got range? Homes come in all shapes and sizes and the Nighthawk X4S AC2600 Smart WiFi Router provides WiFi coverage no matter where you connect in your home. • Ultimate range: WiFi coverage throughout very large homes. • Antennas: High-powered amplifiers and 4 high-performance external antennas. There’s nothing more frustrating than lost connections! With NETGEAR’s advanced features and best-in-class technology, you’ll reduce interference & enjoy more reliable WiFi connectivity. • Quad-Stream: Quad-Stream Wave 2 WiFi increases WiFi speed and range for mobile devices. • Dynamic QoS: Delivers bandwidth prioritization by application and device. Boosts speed, reliability, and range of WiFi connections. With NETGEAR, sharing across your network is fun and easy, anything from accessing stored photos & music to wireless printing. And make sure you keep it safe by using the included ReadySHARE Vault application for backing up Windows-based PCs. • DLNA®: Find and play your media on DLNA TVs, game consoles and media players. • ReadySHARE® USB access: Wirelessly access and share USB hard drive and printer via two (2) USB 3.0 ports. • eSATA: One (1) eSATA port for storing and streaming. • Two super speed USB 3.0 ports: Up to 10x faster than USB 2.0. • MU-MIMO: Multi-user MIMO enables simultaneous streaming to mobile devices. • ReadySHARE Printer: Wirelessly access and share a USB printer. • ReadySHARE Vault: PC software automatically backs up to USB hard drive connected to the router to USB hard drive connected to the router. • Easy install: Easy setup for iPad®, tablets, smartphones and computers. • NETGEAR genie® App: Personal dashboard to monitor, control and repair your home network from a smartphone, tablet or computer. • Push ‘N’ Connect: Easy push button WiFi connections (WPS). • WiFi and power on/off: Convenient power savings. • LED on/off switch: Easily turn LEDs on or off. • VPN support: Secure access to your home network. • Enhanced Parental Controls: Manage website access by family member and device. • Guest network access: Separate and secure access for guests. • Secure WiFi connections: Highest-level wireless security with WPA/WPA2. • Personal FTP server: Customized free URL to create FTP server. • Open source support: Download open source firmware from www.myopenrouter.com. NETGEAR genie makes getting the most out of your home network fun & easy. More than six million downloads of the genie App lets users easily monitor, connect & control their home network from a PC, Mac, tablet or smartphone. With NETGEAR genie you can share & stream music or videos, diagnose & repair network issues, set up parental controls & more. • Makes any printer AirPrint® compatible to print from an iPad® or iPhone®. • MyMedia™: Find & play media files in your network. • Parental controls: Manage web filtering and accessibility by profiles or devices. • EZ Mobile connect: Scan QR code to connect to your home network. • For PC, Mac®, iPhone®, iPad®, & Android® devices. Features • Get ultimate WiFi speeds: up to 2.53Gbps (800+1733 Mbps). • Quad-Stream technology delivers WiFi to multiple devices simultaneously for faster speeds. • Next generation Wave2 WiFi: 160MHz, MU-MIMO, Quad-stream. • Four high-performance external antennas deliver maximum range. • Dynamic QoS prioritizes network traffic by application and device. • Powerful 1.7GHz dual-core processor boosts performance for gaming and streaming. • Beamforming+ improves wireless range and reliability. • Twin USB 3.0 and eSATA ports offer high-speed, USB storage-ready access. • Easily manage your home network with the NETGEAR genie app. • Nighthawk X4S AC2600 Smart WiFi Router (R7800). On the surface we’re asking a relatively simple question here: "What do I need to get my broadband Internet working?" Of course, it’s not quite as simple as that. Worry not, however, for this TekSpek covers both the differences between the two popular kinds of broadband and what you’ll need to get your home computer(s) connected up.